These are fresh roselle which I've bought from the wet market. I find it relatively cheap 100gm for S$0.30? ^0^ Therefore I've bought quite a quantity for making pickled roselle and jam! Rinse the red fleshy calyx thoroughly. Bring a pot of water to boil. Add in clean red fleshy calyx and blanch for about 5 seconds. Remove and drain. Leave aside to cool. In a mixing bowl, add in cool calyx together with lemon juice and 150gm sugar. Mix gently to combine. Prepare a clean jar. Spoon in calyx mixture. Add in remaining 150gm sugar over the top. 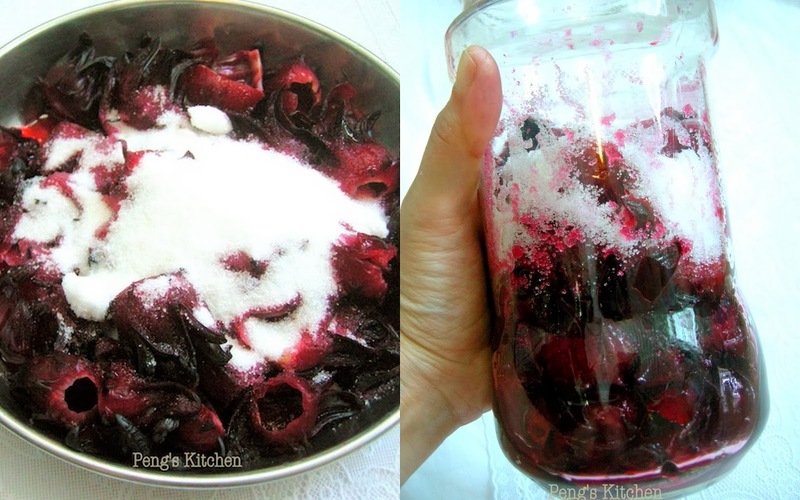 Close the lid and leave the jar at room temperature for 3 days before refrigerate. (turn over the jar each day to ensure all the calyx is evenly covered with the sugar syrup. Puree roselle for making the jam. 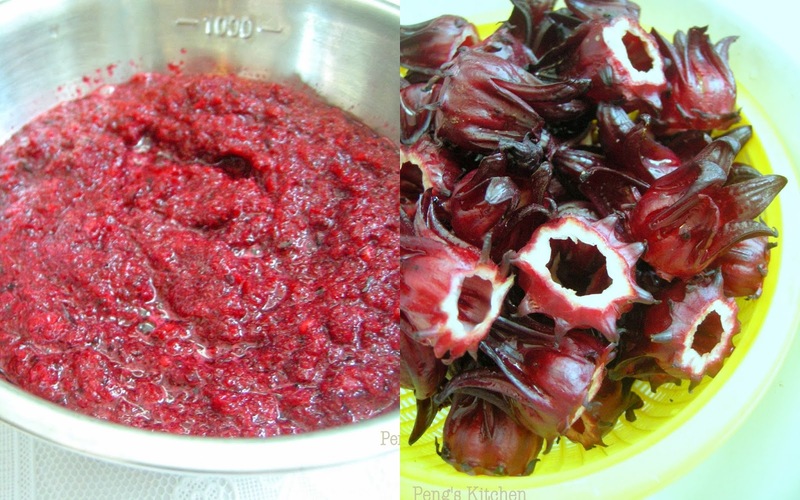 A simple and fast process of cooking the jam by blending the deseeded roselle prior to cooking. Wash the red fleshy calyx till clean. Tear into small size. Blend (in batches) with water till fine. Pour the blended roselle into a pot. Add in sugar and cook at medium low heat until the mixture becomes thick, for about 30mins. Stir occasionally during the end of the process to prevent the mixture fro scorching. Turn off heat. Immediately transfer the jam into a warm sterilised jar and seal up tightly. Looks like roselle jam is really popular lately.... :) I too love this jam a lot!